"Serving Lake Erie Boaters Since 1977"
Legal Notice Information on this website, including URL and other Internet Web site references, is subject to change without notice. Complying with all applicable copyright laws is the responsibility of the user. 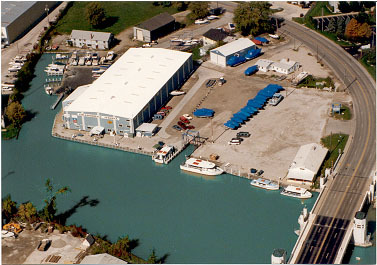 Without limiting the rights under copyright, no part of this website may be reproduced, stored in or introduced into a retrieval system, or transmitted in any form or by any means (electronic, mechanical, photocopying, recording, or otherwise), or for any purpose, without the express written permission of Drawbridge Marina. Drawbridge Marina may have patents, patent applications, trademarks, copyrights, or other intellectual property rights covering subject matter in this website. Except as expressly provided in any written license agreement from Drawbridge Marina, the furnishing of this website does not give you any license to these patents, trademarks, copyrights, or other intellectual property. © 2007 Drawbridge Marina. All rights reserved. The names of actual companies and products mentioned on this website may be the trademarks of their respective owners.